Sunpower solar panels are available in two forms: the Black Residential Panels and the All-Purpose Solar Panels. The all-purpose panels have high power density with total panel conversion efficiency approaching 17% and a power rating of 210-220 watts. This makes them very efficient indeed. These panels have usage in both Grid-connected applications and roof top systems and power plants, making them truly effective solar energy tapping devices. On the other hand, the Black Residential Panels find usage in residential grid-connected applications, uniting appearance and panel efficiency improvement. They have a 72 series connected A-300 solar cells for high power density and watt ratings and sport an All-black design for uniform appearance and easy roofline integration. When you have a grid connected application, you can sell any excess power that you generate at the home or in your office to the grid and make some money as well. The Sunpower solar cells offer up to 50% more power per square foot than conventional solar cells. These panels promise high performance, along with maximum power efficiency and an attractive and efficient design. The solar cells can be effectively utilized to generate electricity. They take up a relatively small amount of space, while providing more solar power (the makers claim that these panels are up to 50% more efficient than conventional panels and up to 100% more efficient than thin-film solar panels. So you can see that they are effective and are convenient as well. The SunPower solar panels are coded as SunPower 225, 230, 210 and 215. They provide electricity for residential purposes and are the industry-leaders in solar power generation. These cells also come, subject to conditions, with a 25 year warranty as well. These solar panels are extremely effective for tapping solar power and generating electricity, while being designed in a way so as to blend perfectly with other residential appliances. Getting solar panels will save you money on your electricity bills. But that is not the only benefit. You can gain from the many alternative energy incentives and also clean the environment because solar power is eco-friendly. So are you ready for solar power? 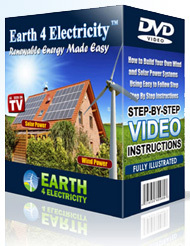 Get a guide that will show you where to set it up and how to install a system. The guide should also show you where to get cheap parts and batteries from and ways you can wire the system effectively. And lastly, you should also know about the safety precautions.